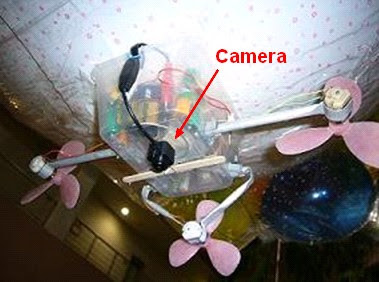 The purpose of the project is to improve the works in mechanical and electrical aspects of a low altitude mini airship for aerial photography with minimal cost. The airship consists of three main parts, the envelope, the gondola and the propulsion system. The design of the envelope combines the latex balloons and gift wrapper sheets. 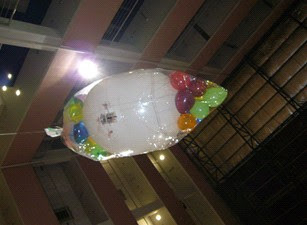 The envelope lifting force is generated by Helium gas inflated inside the latex balloons. For propeller system which is installed in the gondola, three independently controllable motors are used to steer the airship. Structural computations and construction of the mini airship are almost completed based on the author own efforts. Most of the parts from the mini airship are handcrafted. Materials used are appropriate from the study and calculation by the author. In this project, some enhancement and improvement has been carried out and implemented on the prototype which has been completed in the year 2006/07. The prototype is a mini airship which is able to carry out aerial photography. After some study, it is found that the applications and advantages of aerial photography using mini airship are very encouraging due to its low power consumption and also the ability to landing at almost any field. A new blimp design with new material is implemented to provide better lighting force. A better thrust system using higher rating motor and larger capacity batteries are also implemented. A radio controlled pan tilt system is applied to the camera system to improve on photos capturing. This system is made from two radio controlled servos for both panning and tilting respectively. After these improvements, the test flight of the airship is conducted. Images captured are analyzed and their usage are discussed. is this blimp for outdoor applications or indoor?what is its size and payload capacity? The blimp was initially planned to use outdoor. However due to the not so powerful motors and windy condition in the campus, the blimp was only tested indoor. The length is about 170cm and the radius is about 60cm. The payload capacity is almost equal to zero after the camera system is installed.